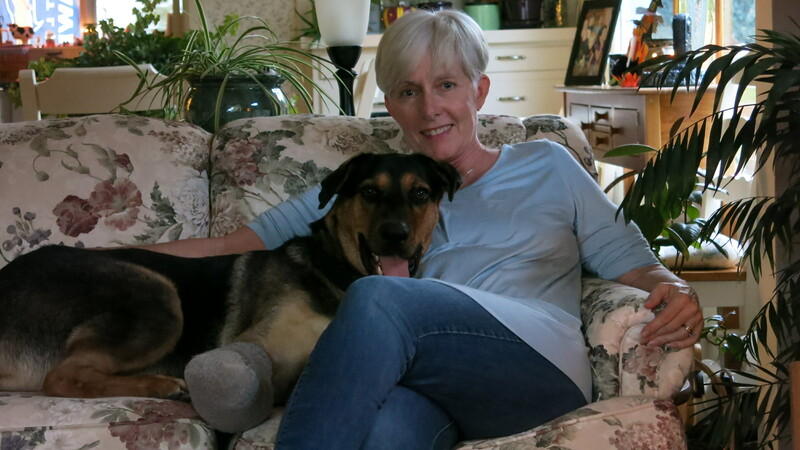 Paula Swanson relaxes with a very content Rudy in their Tacoma home. 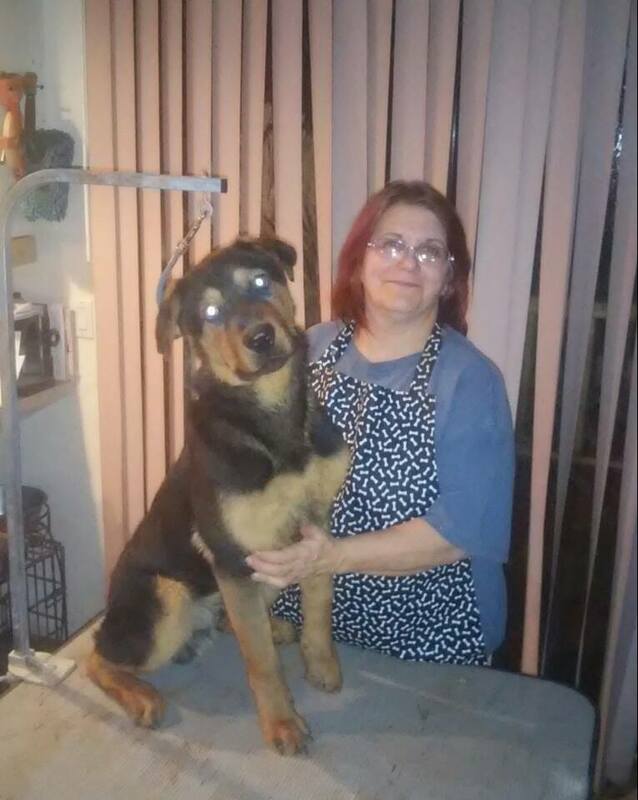 She and her husband, Dan, took ownership of the young Rottweiler last summer after it suffered numerous injures at the hands of its former owner in Idaho. If there is a subject that embodies the definition of underdog, it’s Rudy, whose odyssey is an intoxicating blend of tension and passion. We Americans love our underdogs, no matter what the playing field, from politics to sports, from business to personal life. They are scrappy and defy the odds of winning—or in some cases like this, simply surviving. While Rudy wasn’t in a Nampa, Idaho, courtroom in early October, Team Rudy was there and had his back and every other battered bodily part, in a sentencing trial for his abuser. 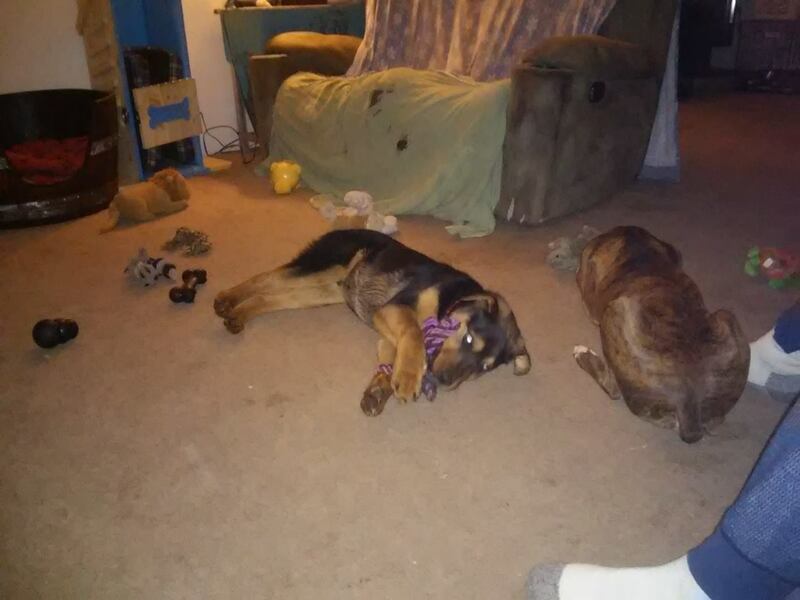 The young Rottweiler was home in Tacoma enjoying life comfortably, a sharp contrast to when he was found walking alongside an Idaho country road badly injured on a cold December morning last year. A good Samaritan found and transported him to the nearby West Valley Humane Society shelter, where his owner was identified by an embedded microchip. The agency attempted to contact the owner without success and placed a “not to be reclaimed by the owner” status on the 5-months-old animal pending an investigation. The dog’s dedicated rescuer, Patti Angeliz, of Valhalla Canine Rescue in Winlock (Lewis County), cared for the injured Rudy for months after he was brought to her last December. Patti Angeliz, of Valhalla Canine Rescue in Winlock (Lewis County) was contacted by Traveling Paws, an all-volunteer Northwest organization, Dec. 21 about interest in accepting Bear (the dog’s name at the time). When she agreed, Nampa shelter officials phoned her and explained all details in the case. Months of continued veterinary treatment resulted in a bill of $2,666.61, which Angeliz presented to the court in hopes of restitution. Rudy’s adopter Paula Swanson has incurred additional veterinary costs $4,766.68 with more likely to come. The early October courtroom date was for the sentencing of Miguel A. Garcia, who pled guilty in August for the continued beatings he administered on the animal last year. A relative, Armando T. Garcia, pled guilty in April for being in the household where the beatings occurred and was fined. Canyon County deputy prosecutor Jed Bigelow gushes with praise of the efforts of Angeliz, Swanson and particularly Melanie Barkalow, animal control officer, in presenting him substantive, well-documented evidence of Rudy’s injuries and Team Rudy’s continued tenacity to make certain Garcia’s sentence was the maximum under state statutes. A regretful Garcia admitted his actions in court, which he said were influenced by methamphetamines, alcohol and marijuana use. He was sentenced to 30 days in jail, two years of supervised probation with a Fourth Amendment waiver to include ownership of any animals (i.e. he is not permitted to own animals while on probation), $300 in fines and cost of restitution ($2,421.44 to Valhalla Canine Rescue) to be paid while on probation. Here’s a rundown of Rudy’s injuries: seven rib fractures, four leg fractures (the most painful was recently repaired by surgery), jaw fracture, dislocated left shoulder, skull fracture, 16 missing teeth and cigarette burns about his body. “This is a great step forward in recognizing animal cruelty as a terrible crime and understanding its correlation to other crimes such as drug abuse, domestic violence and other violent acts,” says Barkalow. Rudy is right at home curled up on the couch. The once-battered dog has been slowly recovering from an assortment of injuries administered to him last year. According to the animal-control officer, the FBI this year has added animal-cruelty crimes to the National Incident-Based Reporting System, which means the agency recognizes these acts as an early indicator of more violent crimes to be committed in the future. Barkalow and a co-worker recently examined statistics of animal-cruelty charges issued by the Nampa Police/Animal Control Departments from January 2011 to October 2015. Fifty-five cases with 56 defendants were charged with animal cruelty—36 of 54 cases involved animals confined in a vehicle in hazardous condition (hot car in high summer temperatures); five of 54 cases for abandoning an animal; 14 (including Garcia’s) for either negligent or intentful abuse. Thirty-two defendants were found guilty in court, 18 cases saw the charges dismissed in court and six cases remain active. The Garcia sentence, says Barkalow, garnered the most significant penalties, including the imposed jail time. Angeliz concurs, “This is an amazing victory for those of us that fight animal abuse on a daily basis. I believe it opened the door to change the laws from animals being looked at as just being property to one where they can be considered as sentient beings who can be victims. Prior to attending Garcia’s sentencing, Swanson wrote to the court, asking that Garcia receive the maximum penalty. “What Mr. Garcia did to Rudy was horrendous, heartbreaking and incomprehensible to me. He was a puppy—not even 6 months old. Mr. Garcia tortured and abused this gorgeous, trusting creature. “I am a registered nurse and I’m currently the director of surgical services for Tacoma General Hospital and Mary Bridge Children’s Hospital in Tacoma, Washington. I have spent my entire 40-year career in the operating room. I have seen many fractured legs, spines, skulls, facial trauma, burns and dislocations during my career. The patients who experience these injuries are in horrendous pain and they suffer terribly. Fortunately, my patients have had the advantage of modern medicine to help them recover and alleviate their pain. Rudy was not given that same care. “His poor, little body was broken, but then he was left to suffer in terrible pain, with no veterinary medical care. Can you imagine how frightened he must have been as he suffered alone? As if that’s not bad enough, while he was trying to heal from one injury, he was abused again and again, causing even more trauma, which also was not attended to. Outstretched with a cast on his right front leg, the young four-legged patient faces more medical procedures in the future. The cast has since been removed and his mobility is much improved. The 16-months-old Rottweiler, which weighs 68 pounds, most likely faces plenty of health challenges ahead. His right front leg that was badly bowed out and a paw that was turned almost 45 degrees were recently addressed with surgery and the limb was casted. A repeat surgery may be required in the near future. The surgeon is also concerned about his back legs and left shoulder but treatment for those will have to wait, says Swanson, until the right front limb is functioning correctly. Rudy is also being treated for seizures, which are direct result of his fractured skull and subsequent brain injury adds the owner. 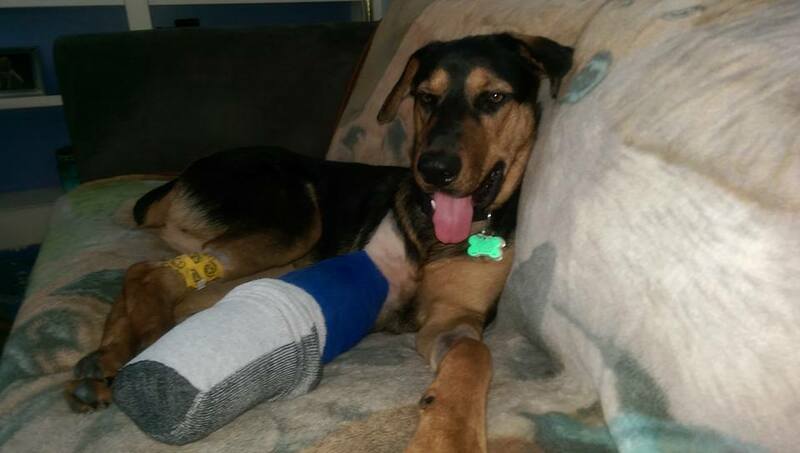 He has not had any seizures since July 26, when he was still at Valhalla Canine Rescue. The Swanson household includes four other dogs, ranging in age from 5 to 11. 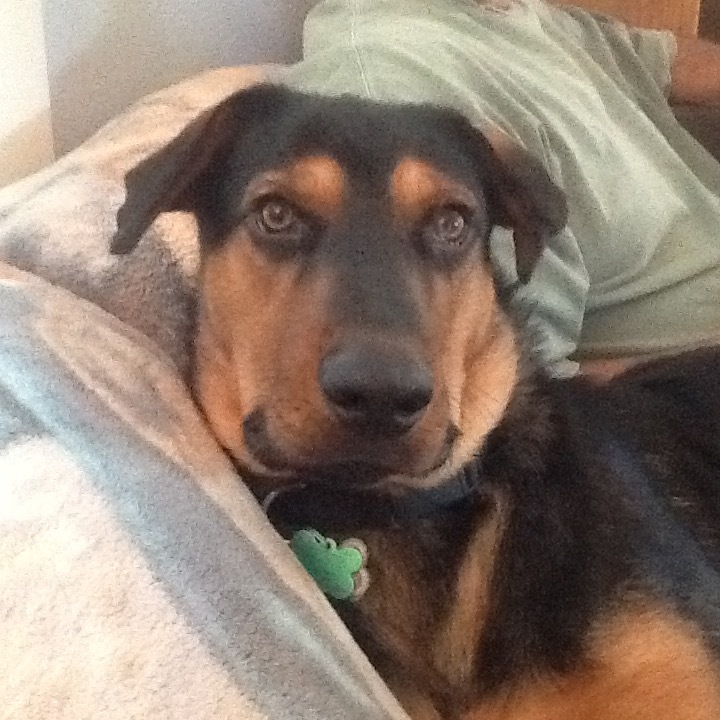 Rudy’s socialization exposure has been limited, however, because of the need to address his medical challenges. Consequently, he is lacking “doggy awareness,” Swanson concedes, but that day will come soon. During his stay at Valhalla Canine Rescue, Rudy had his choice of a wide variety of toys. Here he takes a much-needed break with another resident after play time. At the outset, Rudy had no awareness of personal space with dogs or humans, consequently he would crash into them when running or lay down on top of them. “As my other dogs were adults, this was quite a shock to them. Fortunately, they were able to appropriately correct him with just a bark or a growl. He’s no dummy. He caught on quickly,” Swanson explains. The potential training and medical challenges Swanson and her husband, Dan, have faced are not for everyone. Having been an operating-room nurse for 40 years has served her well, she says. Any surgical procedure Rudy has faced or will be confronting has a been there, done that feel for her. Through the first week every time Dan would enter a room where Rudy was, the dog would bark and growl. That was quickly overcome with treats and Dan speaking to him in soft tones. She adds that Rudy has been friendly from the get-go with her adult son and son-in-law and all eight grandchildren. While Rudy stands as an ambassador of forgiveness and hope, he’s a survivor only because of those dedicated individuals who extended a compassionate footprint for months as rescuers, caretakers and advocates.